FIS board members gathered for a group photo with Dr. Milan Vaishnav (second from left). The event, which started and ended on time was emceed by FIS Director Nischay Bhan. It began with a welcome address by Krishna Vavilala, FIS’s founder and chairman. Mr. Vavilala provided a brief history of FIS and its numerous achievements during the past 13 years. He said, FIS presents a neutral platform to discuss all issues concerning India without taking sides. He cited the recent Distinguished Lectures provided to the community including those by Gilad Katz and Anupam Ray the CGs of Israel and India, Santosh Hegde, Justice of the Indian Supreme Court, and various Professors and dignitaries. 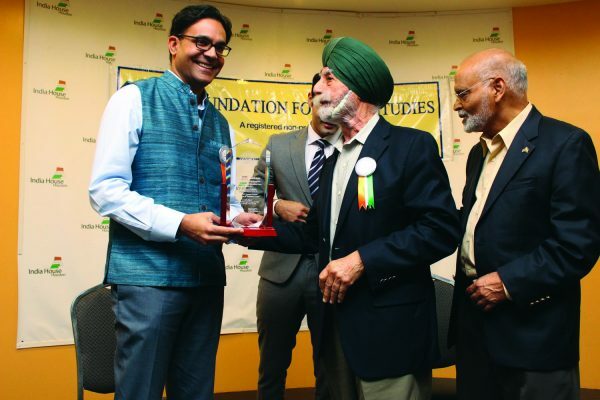 Dr. Vaishnav is the newest among FIS’s distinguished lecturers. After Mr. Vavilala’s presentation, Mr. Bhan introduced Dr. Vaishnav who proceeded to give a spirited, intelligent, thought provoking and occasionally light-hearted lecture on the state of India’s democracy. Dr. Vaishnav’s lecture primarily focused on issues of entrenched power, money and corruption in Indian politics. He aimed to analyze the “hawah” around the general elections, and to approximate scenarios for the general election based on several important criteria. One of the issues Dr. Vaishnav discussed in detail was the Congress Party’s recent success in the “Hindi-belt” and their successes in states historically dominated by BJP. He sought to explain whether the results of that success would translate to the general election. He also analyzed the successes and failures of both BJP and Congress’s attempts to navigate alliances and coalitions. He looked into the impact of money power in current Indian politics and noted that wealthy Indians make up the vast majority of the Lok Sabha. He also provided an incisive look into the recent foreign policy issues at India’s border with Pakistan, PM Modi’s military action, and the impact of having a strong centralized leader on the future of Indian democracy. 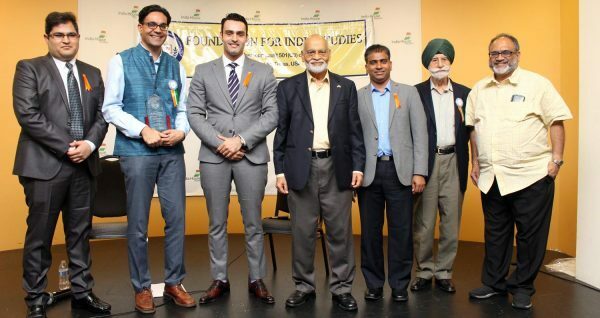 FIS board member Raj Bhalla (center) presents a momento to Dr. Vaishnav with FIS Director Nischay Bhan and FIS founder and chairman, Krishna Vavilala. Ultimately, Dr. Vaishnav concluded, based on his analysis of the factors he had examined, that PM Modi was likely to remain in power, but with less seats for BJP than in prior years. This was consistent with his analysis of both parties’ relative strengths and weaknesses, and the positions they had taken on many issues. also the emcee for the program. Dr. Vaishnav was asked several difficult questions about Indian politics. These included questions regarding India and Kashmir, the efficacy of a two-party system in India, and his vision for India in fifty years.